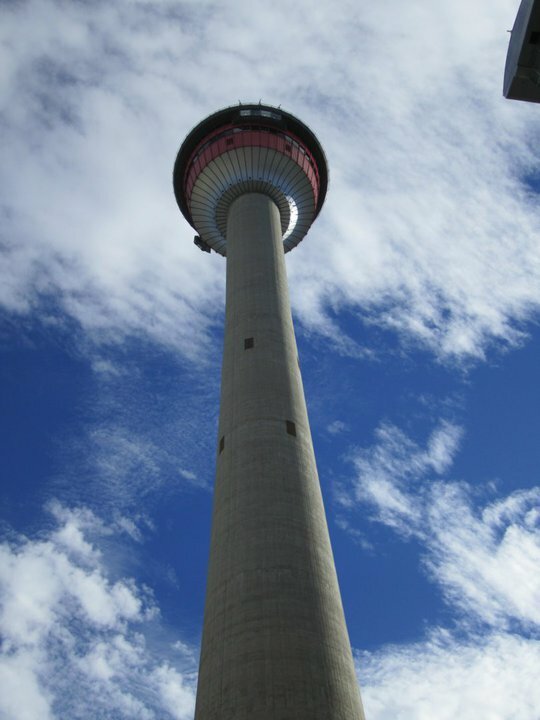 The Calgary Tower surges to the sky on a hot summer day. For those, like me, who have ever lost touch with their home town, I invite you to take the time to explore and rediscover the sights and sounds in your own backyard — it might surprise you to find that adventure awaits at every turn! 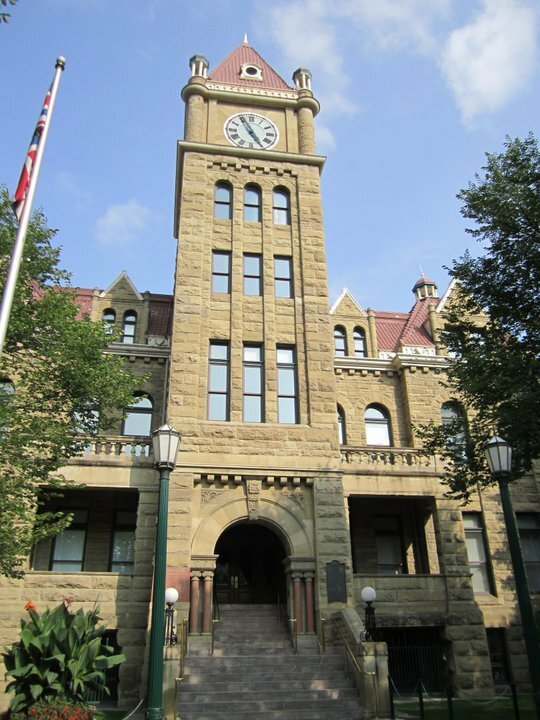 Granted, Calgary is still a “young” city on the world stage, but there is nonetheless a rich and colourful history that is proudly on display at Heritage Park. Once a humble outpost, Calgary has grown in leaps and bounds and evolved into a major urban centre, but its western small-town roots are firmly entrenched and well-preserved. A stroll around Heritage Park takes you back in time to the early days when the “wild west” was being tamed and the seeds of modern-day civilization were planted. An old-fashioned train and steamboat, along with horse-drawn wagons and crank-style cars provide a glimpse into early modes of transportation, and the sweet and succulent aromas emanating from the bakery and candy shoppe leave your taste buds salivating for the goodness of simple pleasures like home-baked bread and melt-in-your-mouth gum drops! Period costumes are donned by all staff members and there is even a theatrical troupe that shares their acting, singing and dancing skills in entertaining (and sometimes hysterical!) skits staged throughout the park. The most recent addition on the grounds is the large and impressive Gasoline Alley that boasts outdoor and indoor displays showcasing the transition from the old to the new west once cars, trucks, planes, etc. became more prevalent and enabled the expansion and growth of Calgary from a small town to a big, booming city, which it remains to this day! 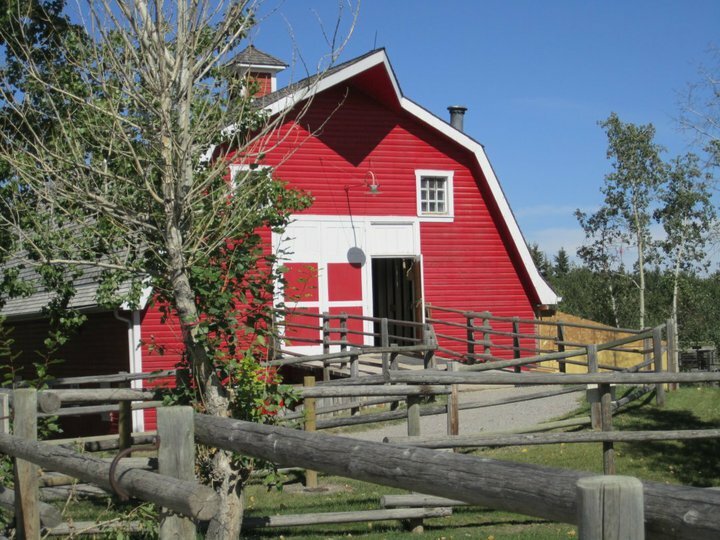 A classic red barn at Heritage Park. Calgary may be referred to in some circles as “Cowtown”, but while this term is appropriate for the city’s western heritage, it unfortunately does not do justice in reflecting the truly urbanite aspects the city has taken on over the years, including the host of large concrete buildings that stretch for blocks of avenues and streets, east to west and north to south. In fact, one of the things I like the most about Calgary is the expansive downtown skyline, which is impressive from any direction it is viewed from, and, for my money, rivals the likes of NYC, TO, LA and other major centres. I will concede that by current standards the Calgary Tower is certainly dwarfed by its competition, but it nonetheless has a very unique shape and still attracts its fair share of visitors. Despite the lagging economy and predictions of doom and gloom around the globe, new buildings continue to be built and The Bow and Eighth Avenue Place are both recent additions to the landscape that have greatly added to Calgary’s claim to fame as the mecca of corporate headquarters. 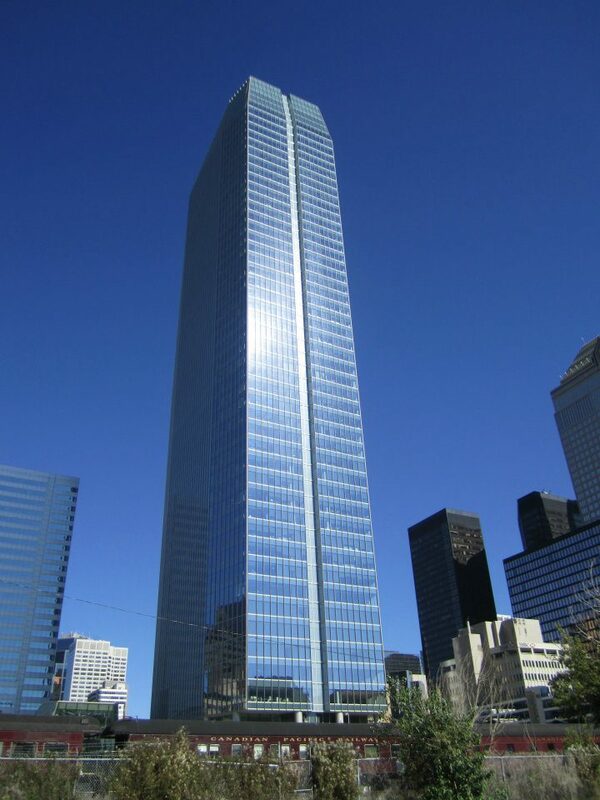 Eighth Avenue Place glitters and gleams in downtown Calgary. One of the lasting legacies of the 1988 Winter Olympics is found across the street from City Hall. Olympic Plaza is where the medal ceremonies took place and to this day is still a main gathering site for Calgarians to congregate throughout the year be it for New Year’s Eve, Canada Day, or Stampede celebrations. It was also the site for Calgary protestors showing support for the Occupy Wall Street inspired movement that swept through many cities in 2011. 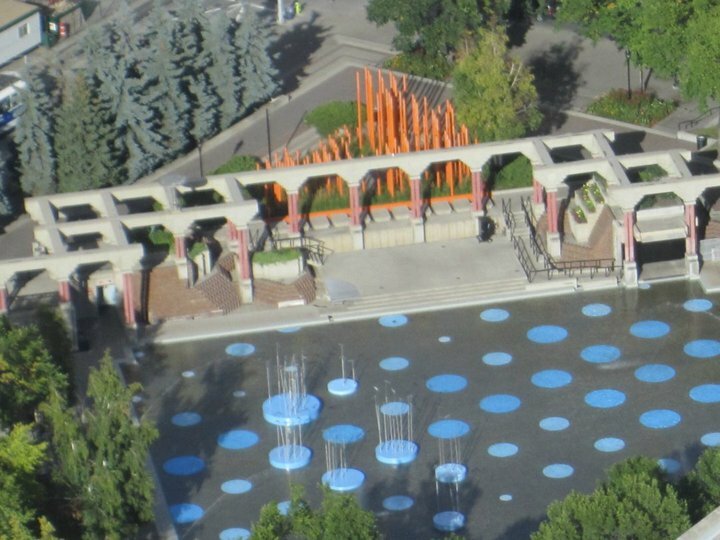 Olympic Plaza as seen from the Calgary Tower. During the December/January holiday season, McDougall Centre is one of the most festively decorated buildings in the downtown core and is a sight to behold, but it also has tremendous eye appeal during the rest of the year. The grounds are well-treed, well-groomed and well-lit making it a very fitting office for when the Premier of Alberta is in town. The setting sun casts a warm glow across the stone exterior of McDougall Centre. 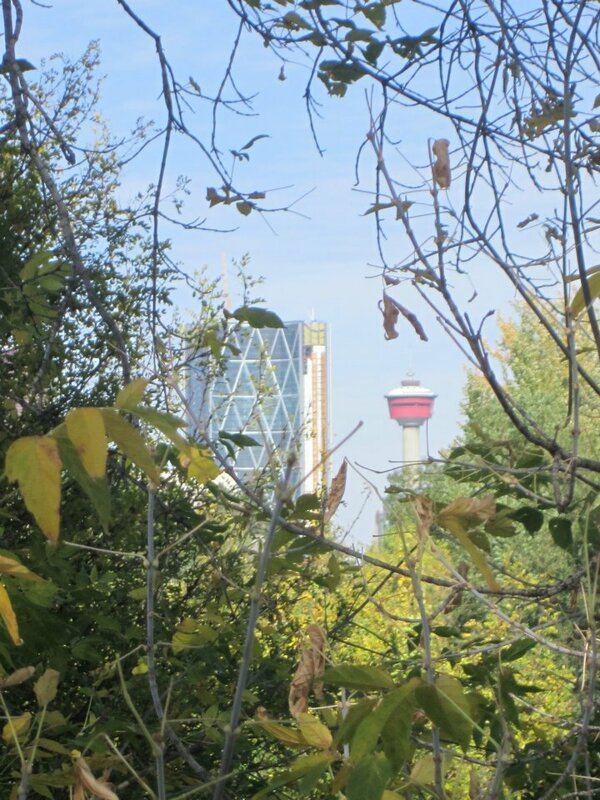 Prince’s Island Park / Riley Park – Have park, will picnic and photograph! Too much concrete can be overwhelming, so kudos to those city planners from days gone by who had the foresight to allow for natural green spaces to remain intact while still allowing for the growth and expansion of new areas around the city’s core. Calgarians love their parks and flock in droves to them as time and weather allow. Alas, if only Mother Nature would cooperate and deliver up a warmer and longer summertime, these parks would be utilized all the more! A flower bed boldly blooms in Riley Park. Halfway between downtown and the well-known 17th Avenue corridor lies the Beltline that attracts quite a Bohemian crowd with its bevy of diners, coffee houses, shops, libraries, parks, apartment/condo complexes, churches and every other conceivable creature-comfort needed to survive in the big city. Yes, it’s a trendy spot to set up an abode or just while away the time on the weekend. 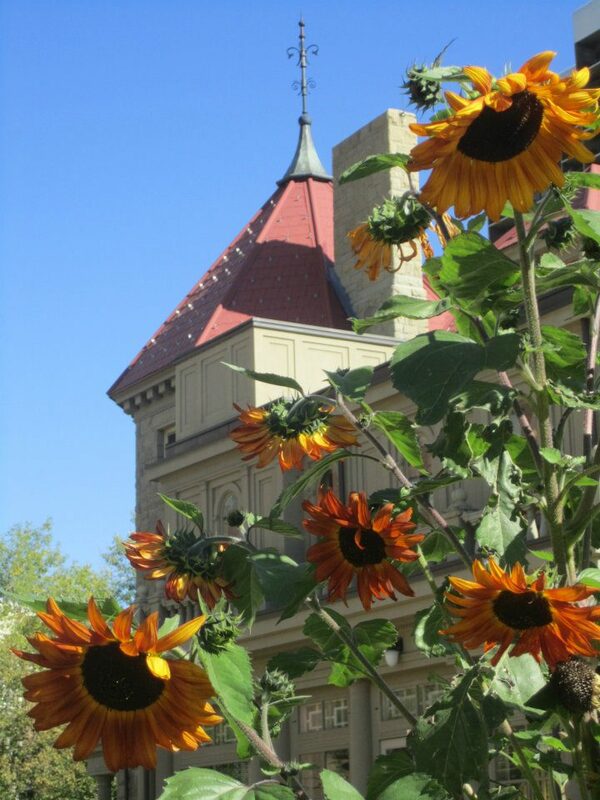 Historic Lougheed House in the scenic and popular Beltline district. Truly one of the most picturesque settings in Calgary (and highly priced real estate areas! ), the south end of 4th Street SW that converges with Elbow Drive is a little bit of paradise in the big city. Like the Beltline, this area also has a lot of amenities and draws a large crowd for the annual Lilac Festival in the spring. A view of downtown from the Elbow River Pathway. 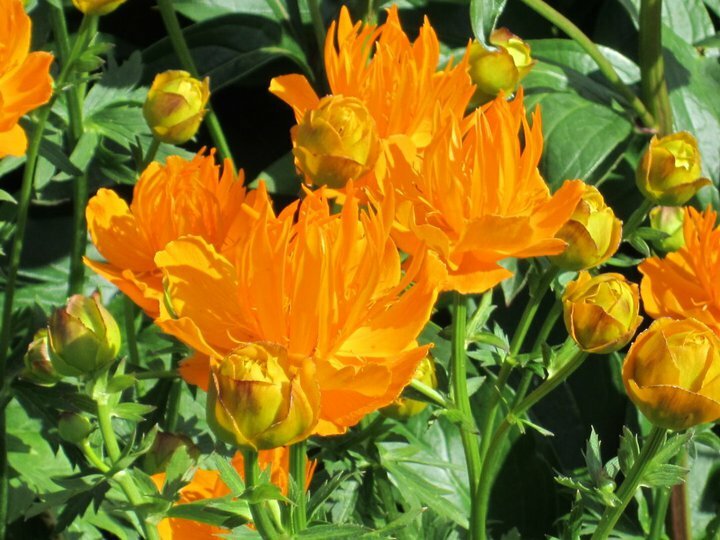 The Calgary Zoo – Lions and tigers and bears, oh my, and don’t forget about the dinosaurs! Arguably one of the best zoos in the world, Calgary’s home to wild and domesticated animals of all shapes and sizes — including the life-size and oh-so-real looking models of dinosaurs — continues to expand its exhibits and looks forward to welcoming penguins in the near future. Zoo Lights is a popular winter attraction that sets the zoo aglow during the holiday season and beckons us to not forget our fine furry, feathered, finned and otherwise friends during the long dark days of winter. 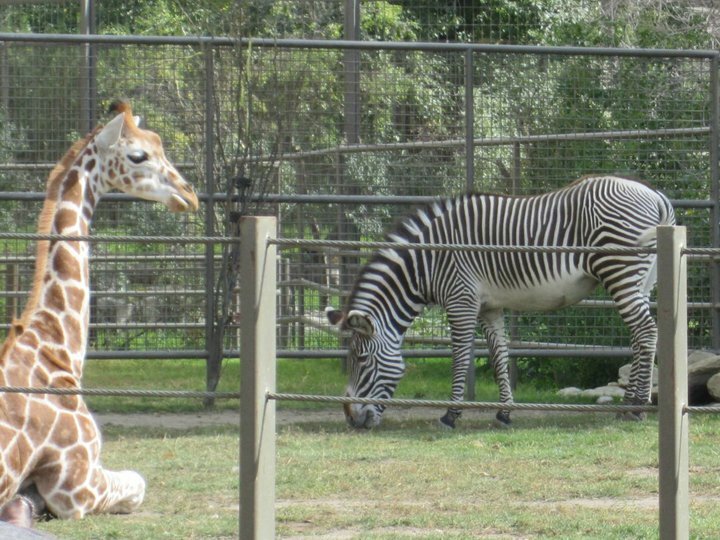 A giraffe and zebra live together in peace and harmony at the Calgary Zoo. 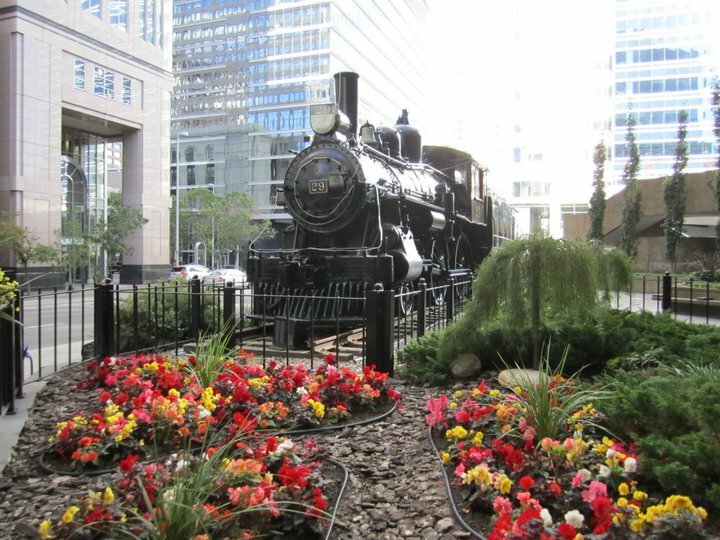 So, as you can plainly tell, there is much to see, do, and enjoy in Calgary and 2012 is the ideal year to plan a trip being the centennial celebration of the Stampede in July. 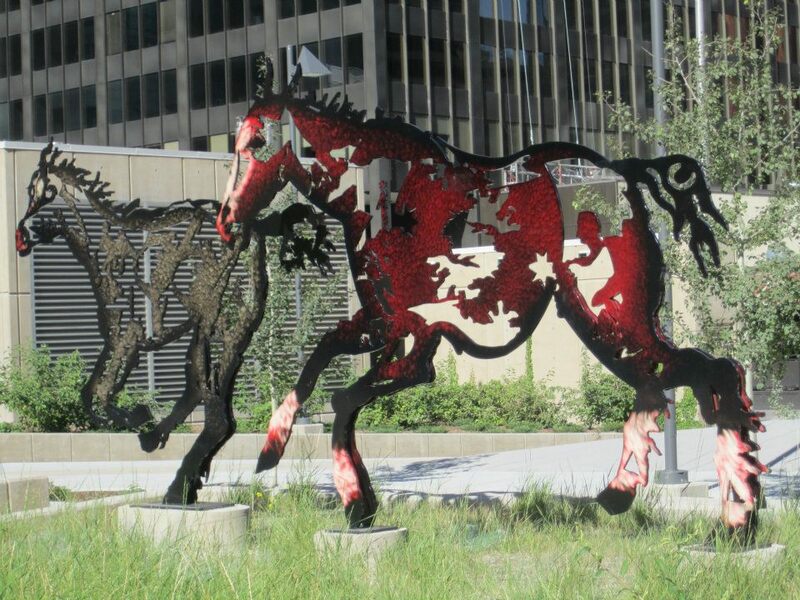 The hootin’ and hollerin’ will be in high gear as Calgary welcomes the world and shows off both its western and urban sides, a duality that makes it a great place to call home sweet home! 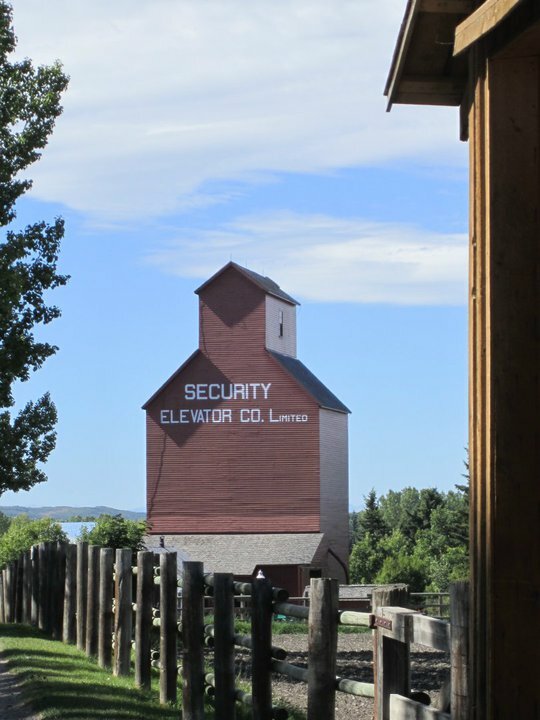 An old grain elevator still stands tall and proud at Heritage Park. 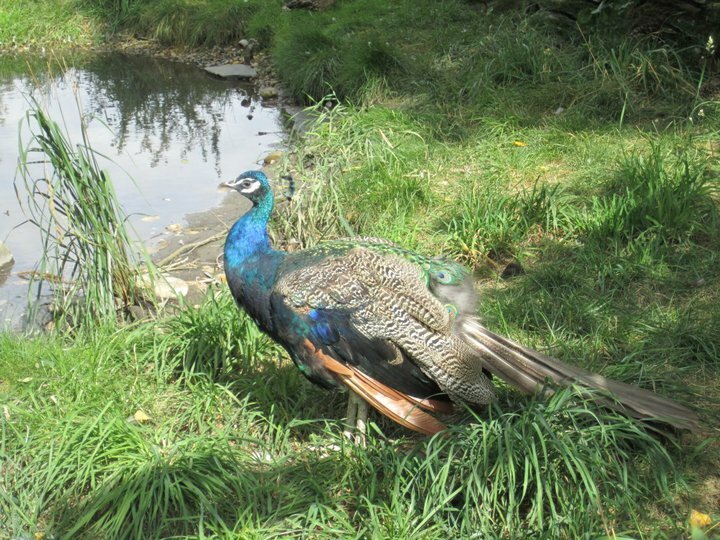 Pretty as a peacock in its prime! 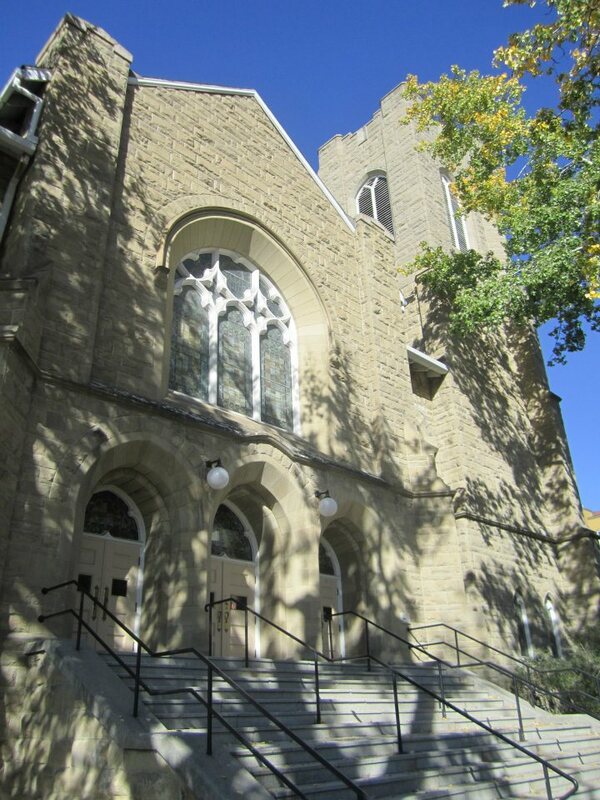 A classic stone church adds charm to the Beltline district. Galloping steel horses near Court of Queen’s bench. 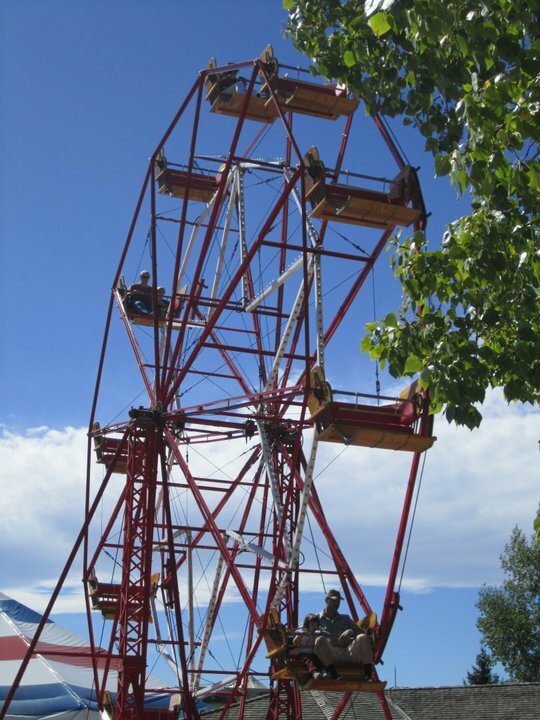 The ferris wheel spins in the sun at Heritage Park. 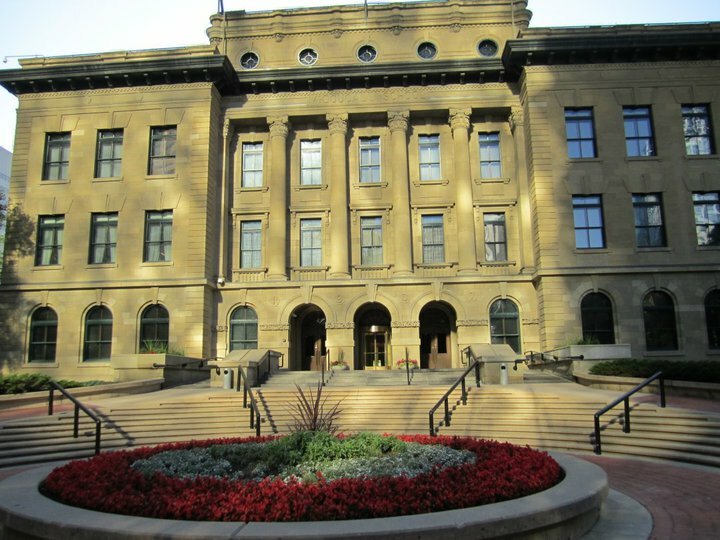 CP Rail headquarters along 9th Avenue SW.
Old City Hall is home of Calgary’s Mayor and City Councillors. 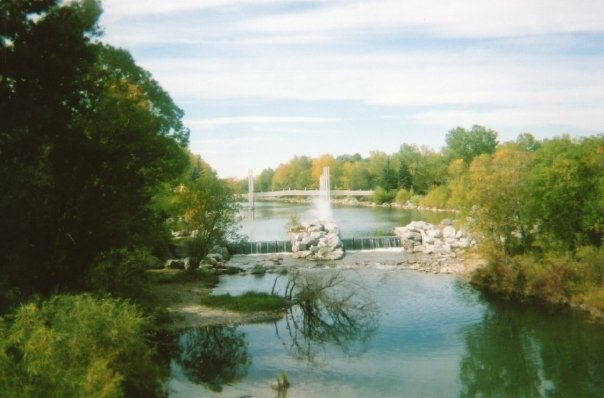 The fountain at Prince’s Island Park. 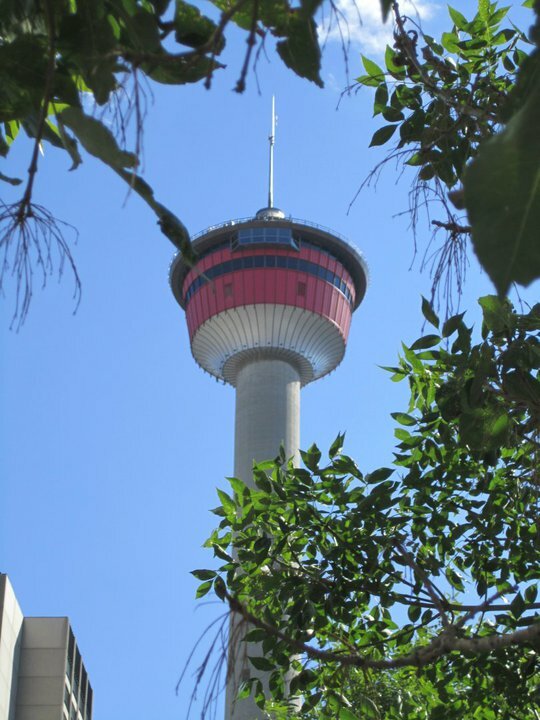 The Calgary Tower framed in greenery and bright blue sky.